The report titled “1, 3-Propanediol Market - Global Industry Analysis, Size, Share, Growth, Trends and Forecast, 2013 - 2019”, published by Transparency Market Research, highlights the basic definition of this market supported with a detailed analysis of the 1, 3-propanediol market considering 2012 as the base year. The report studies and forecasts the 1, 3-PDO market till 2019. In recent years, polytrimethylene terephthalate (PTT) has been the largest consumer segment of the PDO market. PDO market in terms of volume in PTT application is expected to grow at the estimated CAGR of 16.3% from 2013 to 2019. The study report also covers the basics of using PDO to manufacture polyurethane. Polyurethane is poised as the next largest consumer segment of PDO with70% sustainable renewable content. TMR analysts state, “PDO is rapidly replacing 1, 4-butanediol (BDO) as the next sustainable energy resource used for manufacturing polyurethane or industrial chemicals.” Propylene glycol is replaced with PDO as the latter finds increasing applications in personal care and cosmetic products. In 2012, the personal care and detergents category held 8.2% of the overall PDO consumption. PTT is increasingly becoming popular in terms of adoption and implementation because of its unique properties of elastic recovery, resilience, inherent stain resistance, and ease in dyeing. Globally, it is the most well-suited polymer used for manufacturing textile fibers and carpets. The report states that majority of PDO that is produced is utilized in the manufacture of PTT. The global PDO market is dominated by various key players. One of the most prominent players is DuPont Tate & Lyle Bio Products that accounted for around 89% of the market share in 2012. Similarly, entry of many new players will help expand the growth on a large scale. New companies with their enhanced technologies are running small-scale pilot production units of PDO from various renewable resources. Such factors are constantly fueling the growth and production of PDO. The report estimates that by 2019, Asia Pacific will be the largest manufacturer of PDO materials, owing to low raw material prices and reasonable labor charges. 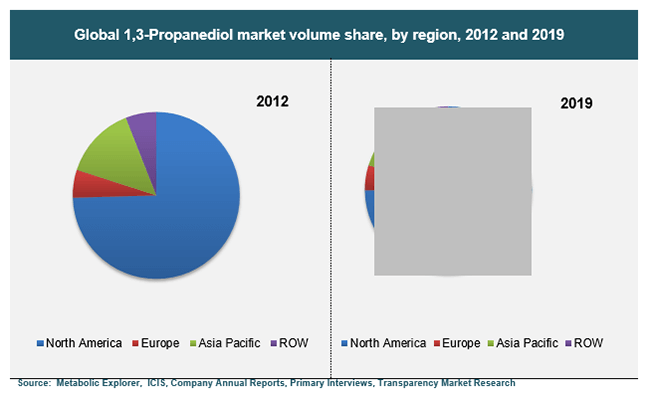 Regionally, North America dominated the 1, 3-propanediol market for PTT with 74.5% of the total market share in 2012. The region is expected to grow further due to the growing carpet and textile industry in the U.S., which is driving the overall market in this region. Similar demand for PDO is also expected in the Rest of the World (RoW) region. RoW is expected to grow at a 14.8% CAGR from 2013 to 2019, followed by Europe, which accounted for 5% market share in 2012. The market for 1, 3-propanediol in Europe is expected to reach an estimated value of US$33.3 million by 2019.